Note: If you cannot adjust color uniformity, make sure the Color Mode setting is not set to Dynamic. 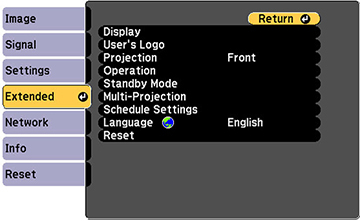 Press the Menu button on the remote or control panel, select the Extended menu, and press Enter ( ). 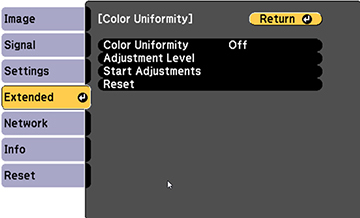 Select the Color Uniformity setting and press Enter ( ). Select On as the Color Uniformity setting and press Enter ( ), then press Esc. Select Adjustment Level and press Enter ( ). Select an adjustment level and press Esc. Select Start Adjustments and press Enter ( ). Select the area you want to adjust and press Enter ( ). Select Red, Green, or Blue and press the left arrow button to weaken the color tone or the right arrow button to strengthen the color tone. Note: The adjustment screen changes each time you press Enter ( ). Press Esc to return to the area selection screen. Repeat steps 8 through 10 for each area, then select All to adjust the entire screen.